Companion piece to Afternoon Tea, Dandelions finds us on a warm spring day, basking in the sun and the breeze, discovering the simplicity and beauty of nature’s most abundant flower. You don’t have to be a child, just a child at heart, to appreciate that glorious burst of yellow. 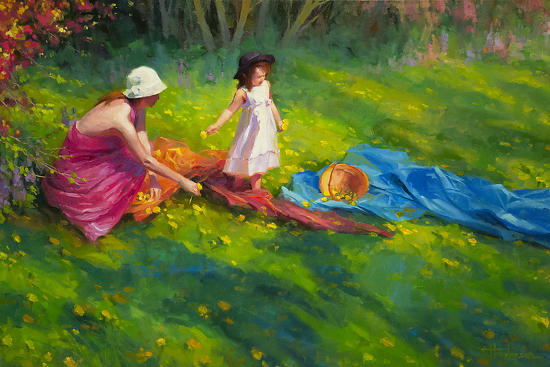 Dandelions, available as an original oil painting, miniature study, and note card, will soon join our line of limited edition, signed prints at Steve Henderson Fine Art. Late Spring Snowpack blends representational work with an element of abstract. 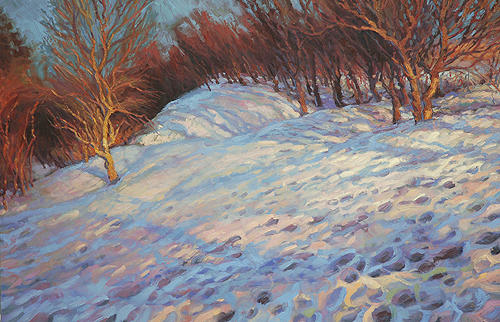 The light reflecting off of the snow introduces a series of lavenders, blues and pinks that contrast with the oranges and umbers of the foliage. Late Spring Snowpack is sold.